Are they capable of calling 911 or neighbors if an emergency occurs? Can they distinguish friends and family from strangers if they are faced with answering the door or having someone enter the home? If they are hungry, can they prepare and eat a meal without your assistance? Is it easy for them to use the bathroom without your help, or do they require aid every time. Are there any other plans in place if they are not able to go to the bathroom without your help? How does their behavior and temperament change from when you leave to when you return? Do they appear angered or scared at the first sign of you leaving the house? In case of emergency are they able to leave the home and seek shelter outside? Are they aware of smoke alarms and unusual noises, which may trigger danger, or are they likely to overlook all such noises? Do they suffer from Alzheimerï¿½s or dementia, and if so are they likely to wander off and get lost easily? Are they routinely experiencing emergencies, which places their life in jeopardy? Do they suffer from epilepsy, or shortness of breath that may need to be monitored all the time? Do they get lonely easily and feel deserted at the slightest moment of your absence? Can they be destructive at times of stress and sickness and cause damage to themselves and your home in the process? Depending on your answers to these questions, your decision on the possibility of leaving your loved one home alone should be clearer. If your answers gave you a sense of dissatisfaction, it is in your best interest to find assistance through a family member or home care aide who can stay with them while you are gone. But if the answers to the questions were comforting, you may still be able to leave your loved one alone, although you must regularly check up on their progress to ensure their safety in the future. This is certainly not an easy situation for all involved, but understand your own feelings and be strong-minded when making the most sensible and safe decision for all involved. All bank accounts, account numbers and types of accounts and the location of banks. Insurance Company, policy number, beneficiary as stated on the policies and type of insurance (health, life, long term care, automobile, etc). Deed and titles to ALL property. Loan/lien information, who holds them and if there are any death provisions. Social Security and Medicare numbers. Military history, affiliations and papers (including discharge papers). Up-to-date will in a safe place (inform family where the Will is located). Living Will or other Advanced Directive appropriate to your state of residence. Driving a car is a symbol of independence and competence and is closely tied to an individual’s identity. It also represents freedom and control and allows older adults to gain easy access to social connections, health care, shopping, activities and even employment. At some point, however, it is predictable that driving skills will deteriorate and individuals will lose the ability to safely operate a vehicle. Even though age alone does not determine when a person needs to stop driving, the decision must be balanced with personal and public safety. Driving beyond one’s ability brings an increased safety risk or even life-threatening situations to all members of society. Statistics show that older drivers are more likely than others to receive traffic citations for failing to yield, making improper left turns, and running red lights or stop signs, which are all indications of a decrease in driving skills. Understandably, dealing with impaired older drivers is a delicate issue. The road to driving cessation is anything but smooth. Each year, hundreds of thousands of older drivers across the country must face the end of their driving years and become transportation dependent. Unfortunately, finding other means of transportation has not noticeably improved in recent years, leading to a reluctance among older drivers to give up driving privileges and of families to remove the car keys. The primary issue facing older drivers is how to adapt to changes in driving performance while maintaining necessary mobility. Despite being a complicated issue, this process can be more successful when there is a partnership between the physician, older driver, family or caregiver. According to the Hartford Insurance Corporation, statistics of older drivers show that after age 75, there is a higher risk of being involved in a collision for every mile driven. The rate of risk is nearly equal to the risk of younger drivers ages 16 to 24. The rate of fatalities increases slightly after age 65 and significantly after age 75. Although older persons with health issues can be satisfactory drivers, they have a higher likelihood of injury or death in an accident. Undoubtedly, an older adult’s sense of independence vs. driving risk equals a very sensitive and emotionally charged topic. Older adults may agree with the decline of their driving ability, yet feel a sense of loss, blame others, attempt to minimize and justify, and ultimately may feel depressed at the thought of giving up driving privileges. Driving is an earned privilege and in order to continue to drive safely, guidelines and regulations must be in place to evaluate and support older drivers. Alzheimer’s disease and driving safety is of particular concern to society. Alzheimer’s disease (AD) is the most common cause of dementia in later life and is a progressive and degenerative brain disease. In the process of driving, different regions of the brain cooperate to receive sensory information through vision and hearing, and a series of decisions are made instantly to successfully navigate. The progression of AD can be unpredictable and affect judgment, reasoning, reaction time and problem-solving. For those diagnosed with Alzheimer’s disease, it is not a matter of if retirement from driving will be necessary, but when. Is it any wonder that driving safety is compromised when changes are occurring in the brain? Where dementia is concerned, driving retirement is an inevitable endpoint for which active communication and planning among drivers, family, and health professionals are essential. Current statistics from the Alzheimer’s Association indicate that 5.3 million Americans have Alzheimer’s disease (AD) and this number is expected to rise to 11-16 million by the year 2050. Many people in the very early stages of Alzheimer’s can continue to drive; however, they are at an increased risk and driving skills will predictably worsen over time. The Alzheimer’s Association’s position on driving and dementia supports a state licensing procedure that allows for added reporting by key individuals coupled with a fair, knowledgeable, medical review process. Overall, the assessment of driving fitness in aging individuals, and especially those with dementia, is not clear cut and remains an emerging and evolving field today. Not all doctors agree that they are the best source for making final decisions about driving. Physicians may not be able to detect driving problems based on office visits and physical examinations alone. Family members should work with doctors and share observations about driving behavior and health issues to help older adults limit their driving or stop driving altogether. Ultimately, counseling for driving retirement and identifying alternative methods of transportation should be discussed early on in the care process, prior to a crisis. Each state has an Area Agency on Aging program that can be contacted for information, and referrals can be made to a social worker or community agency that provides transportation services. Resources do exist to help physicians assess older adults with memory impairments, weigh the legal and ethical responsibilities, broach the topic of driving retirement and move toward workable plans. The Hartford Insurance Corporation, for example, offers two free publications that make excellent patient handouts: At the Crossroads: A Guide to Alzheimer’s Disease, Dementia and Driving and We Need to Talk: Family Conversations with Older Drivers. These resources reveal warning signs and offer practical tips, sound advice, communication starters, and planning forms. Other resources can be found through the Alzheimer’s Association. Physicians can also refer to the laws and reporting requirements for unsafe drivers in their state and work proactively with patients and their families or caregivers to achieve driving retirement before serious problems occur. Ultimately, assessing and counseling patients about their fitness to drive should be part of the medical practice for all patients as they age and face health changes. “How will you know when it is time to stop driving?” was a question posed to older adults in a research study. Responses included “When the stress level from my driving gets high enough, I’ll probably throw my keys away” and “When you scare the living daylights out of yourself, that’s when it’s time to stop.” These responses are clues to a lack of insight and regard for the social responsibility of holding a driver’s license and the critical need for education, evaluation and planning. Realizing one can no longer drive can lead to social isolation and a loss of personal or spousal independence, self-sufficiency, and even employment. In general, older drivers want to decide for themselves when to quit, a decision that often stems from the progression of medical conditions that affect vision, physical abilities, perceptions and, consequently, driving skills. There are many things that an older adult can do to be a safe driver and to participate in his or her own driving cessation. Plan the safest route before driving and find well-lit streets, intersections with left turn arrows, and easy parking. Ask the doctor or pharmacist to review medicines—both prescription and over-the counter—to reduce side effects and interactions. Have eyes checked by an eye doctor at least once a year. Wear glasses and corrective lenses as required. Initially, it may seem cruel to take an older person’s driving privilege away; however, genuine concern for older drivers means much more than simply crossing fingers in hopes that they will be safe behind the wheel. Families need to be vigilant about observing the driving behavior of older family members. One key question to be answered that gives rise to driving concerns is “Would you feel safe riding along with your older parent driving or having your child ride along with your parent?” If the answer is “no,” then the issue needs to be addressed openly and in a spirit of love and support. Taking an elder’s driving privileges away is not an easy decision and may need to be done in gradual steps. Offering rides, enlisting a volunteer driver program, experiencing public transportation together, encouraging vehicle storage during winter months, utilizing driver evaluation programs and other creative options, short of removing the keys, can be possible solutions during this time of transition. Driving safety should be discussed long before driving becomes a problem. According to the Hartford Insurance survey, car accidents, near misses, dents in the vehicle and health changes all provide the chance to talk about driving skills. Early, occasional and honest conversations establish a pattern of open dialogue and can reinforce driving safety issues. Appealing to the love of children or grandchildren can instill the thought that their inability to drive safely could lead to the loss of an innocent life. Family members or caregivers can also form a united front with doctors and friends to help older drivers make the best driving decisions. If evaluations and suggestions have been made and no amount of rational discussion has convinced the senior to cease driving, then an anonymous report can be made to the Department of Motor Vehicles in each state. Finally, it is suggested that family members learn about the warning signs of driving problems, assess independence vs. the public safety, observe the older driver behind the wheel or ride along, discuss concerns with a physician, and explore alternative transportation options. There are a multitude of solutions and recommendations that can be made in support of older drivers. Public education and awareness is at the forefront. An educational program that includes both classroom and on the road instruction can improve knowledge and enhance driving skills. The AAA Foundation provides several safe driving Web sites with tools for seniors and their loved ones to assess the ability to continue driving safely. These include AAAseniors.com and seniordrivers.org. They also sponsor a series of Senior Driver Expos around the country where seniors and their loved ones can learn about senior driving and mobility challenges and have a hands-on opportunity to sample AAA’s suite of research-based senior driver resources. Information on the Expos is available at aaaseniors.com/seniordriverexpo. AARP offers an excellent driver safety program that addresses defensive driving and age-related changes, and provides tools to help judge driving fitness. Expanding this program or even requiring participation seems to be a viable entry point for tackling the challenges of driving with the aging population. CarFit is an educational program that helps older adults check how well their personal vehicles “fit” them and if the safety features are compatible with their physical characteristics. This includes height of the car seat, mirrors, head restraints, seat belts, and proper access to the pedals. CarFit events are scheduled throughout the country and a team of trained technicians and/or health professionals work with each participant to ensure their cars are properly adjusted for their comfort and safety. Modification of driving policies to extend periods of safe driving is another solution. Older drivers nearing the end of their safe driving years could ‘retire’ from driving gradually, rather than ‘give up’ the driver’s license. An older adult can be encouraged to relinquish the driver’s license and be issued a photo identification card at the local driver’s bureau. The Alzheimer’s Association proposes several driving assessment and evaluation options. Among them are a vision screening by an optometrist, cognitive performance testing (CPT) by an occupational therapist, motor function screening by a physical or occupational therapist, and a behind the wheel assessment by a driver rehabilitation specialist. Poor performances on these types of tests have been correlated with poor driving outcomes in older adults, especially those with dementia. Requiring a driving test after a certain age to include both a written test and a road test may be an option considered by each state. Finally, continued input and guidance will be necessary from AARP, state licensing programs, transportation planners, and policymakers to meet the needs of our aging driving population. It is appropriate to regard driving as an earned privilege and independent skill that is subject to change in later life. In general, having an attitude of constant adjustment until an older individual has to face the actual moment of driving cessation seems to be a positive approach. Without recognizing the magnitude of this transition, improving the quality of life in old age will be compromised. Keeping our nation’s roads safe while supporting older drivers is a notable goal to set now and for the future. Who doesn’t feel overwhelmed sometimes by the bustle of the holiday season? Add to that the responsibility of caring for a frail elderly loved one, and burnout is simply a concept waiting to become reality. But wait. If you’re one of the 22 million households providing care for a family member or friend, there is hope. Stress doesn’t have to take the starring role in your family festivities this year. If you’re like the increasing number of Americans who are trying to offer a sense of dignity to your parent(s), include them in seasonal events and help them stay in their own home, safety is your number one priority. Most accidents happen at home in unsupervised situations. This season, enlist the help of older children or a spouse, playing games with (Great) Grandma and (Great) Grandpa while you change beds, do the laundry and other chores. Instead of decorating to the hilt, keep holiday décor simple. Eliminate the need for extension cords on the floor and “declutter” your notion of decoration: use colorful paper garlands strung high instead of breakable objects placed within reach. Remove anything a child or a frail elderly person may stumble over. Replace candles with bright centerpieces of fruit or flowers. Keep candy to an absolute minimum to prevent sugar highs and lows. With the emphasis on “good cheer” during the month of December, the options are many. But don’t wear yourself out trying to make the holidays “happen” for everyone. If you don’t get yourself in a situation where you “overdo” you’ll be more alert to hazards—even emotional ones. Holidays bring emotions to the surface because they hold the most intense memories for your loved ones, and some may not be pleasant. You may find that tears fall for no apparent reason, or that a frail elderly parent suddenly seems gruff or annoyed just when you think everything is fine. Sometimes, the emotional stress of the season makes a frail aging parent seem distant, just when you want to draw them close. We never know what precipitates these reactions; we only have to deal with them. That’s not an easy task, but first and foremost, a caregiver must keep her own emotional balance. Set a few guidelines as to what you expect from yourself. From the very start, set your intention to be positive during the holidays, and to respond with calmness to upsetting scenarios. Sure, things may come to the boiling point at times, but the resolve not to react in like manner will bring the most effective results. People don’t intend to be grumpy, distant or to give you a hard time. These behaviors may simply be a way of asking for help. The best way to give it is by remaining patient, offering consistent encouragement, and setting safe boundaries. You cannot make everyone happy at all times, but you can take responsibility for your own emotional highs and lows. Preserve a few moments each day all for yourself. Take a half-hour break while your children entertain the frail elderly with Christmas music from the 30s, 40s and 50s or interview their grandparents about favorite holiday memories. You might enlist the services of a home-help organization to do some of the household chores while you go grocery shopping or simply take a walk. Professional caregivers can also help alert you to signs of stress or special needs that you might not recognize on a day-to-day basis, curtailing accidents or emotional spills. Keep in mind that a frail person may tire more easily during the holiday season, need more sleep as the days grow shorter, and also need their own “space.” Ask for their help; ask them to let you know what they need and how they want to celebrate. Their answers may surprise you. Above all, an older frail person may crave our respect and our admiration. When we praise the good things they’ve accomplished in life, make certain they know that we appreciate their legacy, and tell them we’re happy they’re with us, things will be a lot easier. If they seem only to complain more, well, just grease the wheel with a little praise for yourself. Send positive messages to yourself out loud and mix in a few more affirmations for them. The holidays are a great time to slow down instead of speed up. Think about all the things you can let remain undone instead of all the things you need to do. Give yourself a challenge to match the tempo of your frail elderly relatives or friends, and see if you don’t enjoy the season more. And after all, isn’t that what the holiday season is all about? Too often, the decision to move into a family member’s home is made when a crisis develops or as a last resort. Sudden illness or injury strikes and the family is left without a plan for long-term care for their loved one. Experts suggest that all families discuss the possibility of the need for long-term care, and the possibility of family members living together as a solution to the daily care situation. The following are some items to discuss with all members of the family before making such a move. Is the home “elder friendly”? It is necessary to review the setup of the home, in terms of stairs, additional bedrooms, bathrooms and general safety issues. If home modifications are needed, they should be completed prior to the move. How much care will the relative require? Daytime supervision, medication management, meal preparation and entertainment are just a few examples of important issues to consider. Assess the level of assistance needed now and in the foreseeable future. If the relative is in poor health, who will be in charge of providing the care? Will other family members share in the caregiving duties? Establish basic rules and a care routine to help prevent conflicts and caregiver burnout. How do family members get along with each other? How are conflicts dealt with? All families have their share of problems and each family handles them differently. The loss of independence is difficult for anyone and reactions or behavior change is to be expected. It is important to be able to talk about how everyone is feeling and encourage the relative to continue with a life of their own. Communication skills, including active listening, are necessary in handling and resolving conflicts successfully. How will the change in household expenses be handled? An increase in family size usually means an increase in family expenses. Will the relative contribute? Are there other family members who can help with financial support? What is expected of the relative? What responsibilities will they have for care of the home? If there is a separate apartment, will everyone dine together? What about family outings – will the relative always be included? Avoid the feeling that the situation is permanent. Start with a limited “trial period,” then review the situation. Once the move has been made to live together, it is very important for all family members to have continual open and honest communication with each other on all matters. Don’t hold in your feelings – both positive and negative feelings need to be shared. If the health condition of the relative changes, and additional care is needed, it is crucial for the family to review the daily plan. If the situation requires help outside the family, there are a number of alternatives that the family and the relative can explore together. Make sure that the relative is included in decision making, if they are able. Some other options for care include: daily home health aide or homemaker care, which would also provide respite relief for family caregivers, home based community care programs, friends and neighbors, church outreach programs and dividing the care responsibilities among the family by rotating care, with the relative going to others’ homes, or by allowing other relatives to come into the home to provide the daily care. Families who maintain open and honest communication and are willing to share in the financial and caregiver responsibilities for a needy relative can successfully reside together in the same home. Support can and should be a two-way street. Where better to get the daily support that we all need than from our family! Contact a Geriatric Care Manager/Aging Life Care Professional™ www.rgcmgmt.com for a free 15 minutes telephonic consultation. Your confined-to-home (or assisted living or nursing home) parent, just wants to have fun! You are focused on their safety, finances, medical treatment, medications, privacy, nutrition and therapy. You busy yourself with monitoring their progress (or decline) and doing everything in your power to keep them comfortable. You worry about their reduced energy level, increasing fatigue, physical weakness and variable mental status. But do you know how important it is for them to just have fun? To laugh deeply, live in the moment, to briefly not be just old and frail, to forget pain? OK, so what can you do? I know that you are thinking, well, they can’t do that much, but you might be surprised at all the options. Too often thoughtful families accommodate so much to their senior’s weakening state that they overlook how much they can do and enjoy! While it’s good to try to bring the world to them with visits, letters, phone calls and email, it’s also important and possible to keep bringing them out in the world. Of course, it may involve more work for you — transporting walker or wheelchair, assisting in/out of cars and doors, walking slowly, negotiating steps carefully, finding bathrooms, keeping him/her dry, warm (or cool) — so be prepared for a different pace and smaller goals. And some cajoling might be needed to just get going. 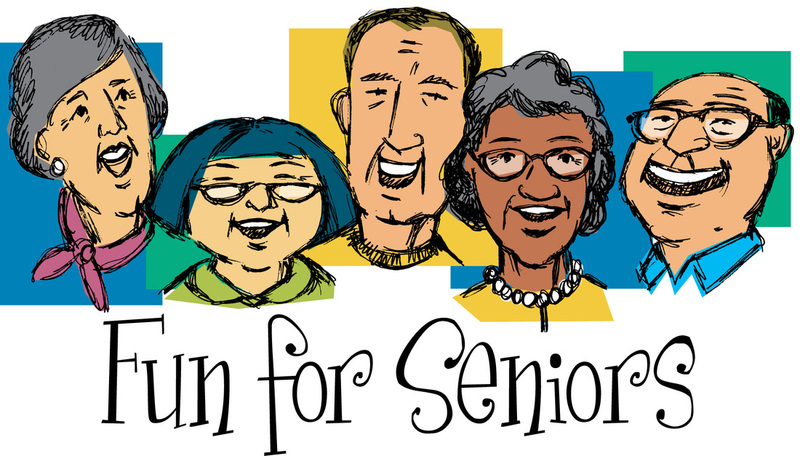 Seniors look forward to having a day out, but as they age, they don’t have the stamina or mobility for trips to fascinating museums, over-stimulating casinos, monster malls, giant sports stadiums, wooded parks, loud modern restaurants, etc. But they may be able to go out for an hour or two. My mom adored a simple trip to the supermarket — colorful flowers, fanciful balloons, acres of fresh, bright produce, bakery smells, energetic families with huge carts. She pushed her walker along, senses on overload, straying down enticing aisles. We didn’t buy a thing. But it was an hour that she talked about for days – a new topic of discussion with her nursing home buddies. Another day we drove one short mile to a local antique shop. “I had those gold Fostoria glasses,” she pointed out. “Your dad and I would stop at the Fostoria factory store on trips to see my brother in Washington, DC.” Talk about the glassware led to reminiscing about her deceased brother, until she0interrupted herself; “Look at the quilts – just like Grandmother’s.” And so on, pushing her walker forward toward the next memory. After about an hour, she had had enough and home we went. The first trip to a small local department store just before Christmas involved a little arm twisting. But once there, lights, perfume, soft velvety fashions and just ahead a decorated Christmas tree, worked their magic. She wheeled ahead, touching, smelling, exclaiming. Onward through silky lingerie, cute children’s clothes and glittering jewelry. At about the hour mark, like Cinderella, she was done. She relived it all week. Recently she and I went to a small jewelry store 10 minutes from her home – she had favorite rings that needed resizing. Instead of just taking them for her, I invited her to come along. For the first time in a long time she became the customer, the center of attention. Soon she asked for a chair, her shopping done. But for her it was a big accomplishment, an errand, like in the old days she so misses. My father-in-law loved an afternoon drive looking at properties we were considering purchasing. He was curious about these houses we described, their yards, their roofs, the neighborhoods. Since we didn’t even bring his wheelchair or get out of the car, it was like a guided tour. “I’ve been in that house” he’d say. “This was always a good neighborhood” he’d remember. “Let’s see what they are building on that hill.” Other mini trips for him were to the cemetery where his wife was buried, their first house in that area and a volunteer organization they founded. He remembered being a neighbor, a businessman, a father and a contributer to the community. Other ideas might be a quilt shop for a former quilter, a hardware store for the ardent handyman, the library, bakery, family style restaurant, plant store or flower shop. You don’t have to go out to have fun of course. Opportunities are right there in their home (or facility) to have fun and fight boredom. Stage a sing-along to his/her favorite music. Play the music loud and clear. Get all dressed up and take some photo portraits – use them for family gifts. Rent/borrow movies for slow afternoons – old ones, funny ones, scary ones. Have a deck of cards on hand and play the old familiar games – gin rummy, hearts, war. Scrabble is great fun with grandkids. Get out of the room – visit other residents, attend sing-alongs, presentations, craft sessions, chair exercises lunch groups. Pull out a family album – get them to identify the older ones you may have forgotten and take notes or audiotape the stories you hear. Family photos trigger floods of memories. Pick a theme for the week or month. Decorate his/her room and door. It will bring people in to check it out and or conversation. Rearrange furniture and pictures – just for stimulation. Order in or pick up some favorite foods that aren’t on the regular menu – hot dogs for my mom, milkshakes for my husband’s dad. Manicures and pedicures are a special treat too. Have candy for drop-in guests and gifts for visitors – order online; think about birthday and holiday gifts and ‘shop’ on line. Make up a Christmas, holiday or birthday wish list from the web – send it to family members. So think about what your loved one has always enjoyed, listen to what they talk about, look around your neighborhood and give it a try! Costs of Growing Old – Will Seniors’ Financial Planning Cover Them All?